Identity are involved with the protests. According to SAP organizers, events are planned at or near 13 state capitols around the country. Several organizers have already obtained permits to rally or completed notices of public assembly as required by local ordinances; others plan to hold sidewalk protests and demonstrations. Targeted states include Alabama, Arkansas, California, Connecticut, Florida, Idaho, Maryland, New Hampshire, New York, Ohio, Pennsylvania, Tennessee, and Texas. The protests got their start in 2011 thanks to Monica Stone, a long-time member of the Louisiana-based white supremacist Christian Defense League and immigrant from South Africa. 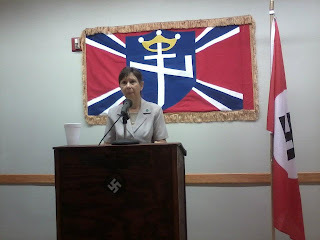 In September 2011, she spoke of the alleged plight of white South Africans at Morris Gulett’s Aryan Nations World Congress event in Louisiana. In fact, SAP uses Gulett’s Louisiana mailing address, while several protests are being organized by members of Gulett's Aryan Nations. For example, Robert Radyn is organizing the Albany, New York, protest, and Ryan Mullins, the “Imperial Wizard” of the Gulett-associated Aryan Nation Knights of the Ku Klux Klan, is organizing the Nashville, Tennessee, event. White supremacists from other groups are also involved with SAP events. California-based Mike Myers, SAP's “Chief Coordinator,” is organizing the rally at Sacramento. Myers is a racist skinhead who claims membership in the Golden State Skinheads and the white supremacist American Third Position. The Austin, Texas, march is being organized by David McGlumphy of Dallas. McGlumphy, a member of the Texas-based street/prison gang White Knights of America (WKOA), was released from prison in early 2010. His wife, Anna, is the Texas contact person for SAP. Billy Roper, the former leader of the Arkansas-based White Revolution, is organizing the rally scheduled in Little Rock. In September 2011, Roper joined Thomas Robb's Knights of the Ku Klux Klan. Robb and his daughter, Rachel Pendergraft, are scheduled to attend the rally. Also attending is Allen Truitt of Missouri, the leader of the Aryan Nations Prison Ministry. Ronnie Carr, a member of the neo-Nazi group Volksfront, is organizing a SAP event in Greenville, Tennessee, “for the people in East TN, West NC, and Southwest VA who can't make it to their respective state capital protests.” Donald Palmer, also affiliated with Volksfront, is organizing the Harrisburg, Pennsylvania, event. In an effort to disguise themselves as civil rights activists, SAP organizers have attempted to discourage would-be attendees from wearing white supremacist shirts, Klan robes, or neo-Nazi uniforms. Billy Roper directed one racist skinhead to cover his white supremacist cranial tattoos with a hat during the protest. Though attendance overall is expected to be low, some of the events are better organized than others. I do not understand why society as a whole and organizations such as the adl look down those who choose to spread awareness about racism centered on whites as opposed to the brown races. The adl is no less racist than any white supremacist group. It is amusing that this organization is called the "anti defamation league", yet, it seems as though all of your reports are just defamation of that which you do not agree with. Please, do some research on the Boer Crisis, and also Julius Malema, and I know that you too will see the racial extremism that is happening at the hands of the anc, although, you will most likely disregard it as politically incorrect. Thank you. WHY DID YOU REMOVE MY COMMENT ? DONT YOU LIKE THE TRUTH? GENOCIDE OF WHITES IN SOUTH AFRICA PROMOTED BY THE JEWS. It's sad to see bigots using the ongoing crisis in South Africa to promote their hateful views, but there can be no denying that whites in South Africa are facing hate and discrimination by their own government, and actions (which sometimes include outright murder) by racist black citizens in South Africa. The organization Genocide Watch has been following the situation since at least the early 2000s, and by looking at their data and news reports, one can clearly see that the situation in South Africa is getting worse, not better. I wish the ADL would be more detailed in their reporting on such matters. The fact that the mainstream news media (especially in the US) hasn't reported much on the situation in South Africa is one of the main reasons why white supremacist groups are using it as a tool in their recruitment efforts. The ADL is nothing more than a Jewish Supremacist group. They condemn and lie on anyone that opposes their Zionist Agenda. Funny thing how misinformed people do not know that this group is affiliated with the Mossad. Their mission is the destruction of Western Civilization. To hell with you ADL and all of your other Zionist Agents that are in this country.